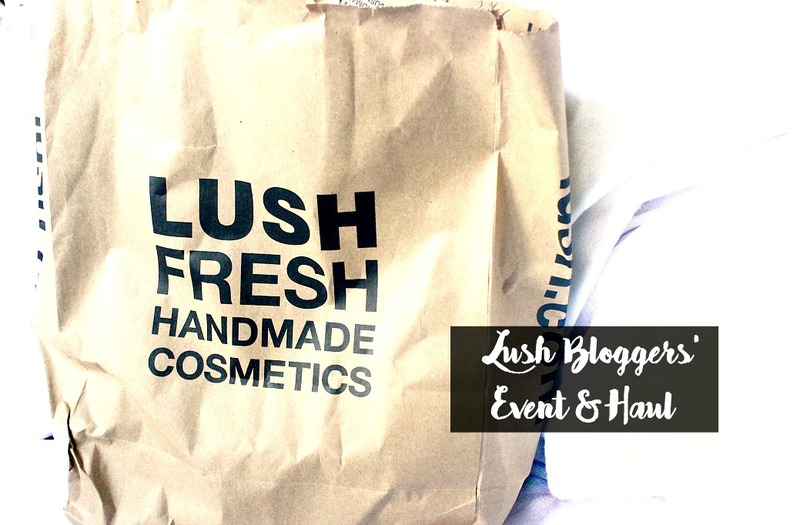 Hello hello, todays blog post is on the wonderful annual Lush event - honestly if you're a blogger and you haven't gotten in touch with your local store, you're missing out! They love holding these events and educating us bloggers on the beautiful new seasonal products. I was exhausted that day but very much looked forwards to attending and it was so nice meeting a couple of new people too! Seeing all the new halloween and Christmas products was great and I thought it was so nice how they had vegan snacks and non-alcoholic drinks for everybody to enjoy. The event always starts by passing around a Lush shower jelly and introducing ourselves, along with our blog/youtube channel. We then were given a quick tour of the store set up, followed by a 'spot the new release' sort of game, which was different and a more exciting way of seeing each product as a group. I managed to create a couple of GIFs I know I know, how fanceeh! This is the Autumn Leaf Bath Bomb (£3.75) which I was simply mesmerised by...look at all those stunning colours! 😍 The colours are supposed to reflect the stunning autumn leaves falling onto the floor, although I love the more pastel colours in this version. 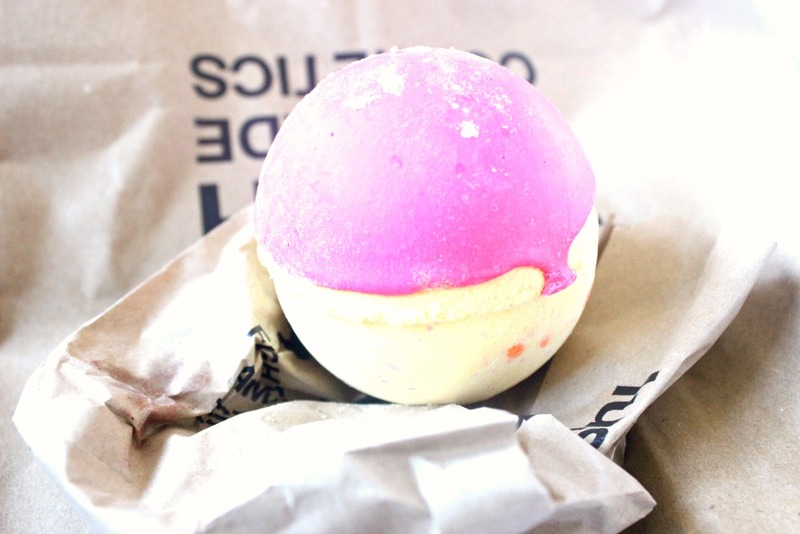 The three main oils in this bath bomb are Neroli Oil for uplifting and toning, sandalwood oil for uplifting and soothing the skin and bergamot oil for uplifting and cleansing. So as you can imagine it has quite a woody scent, which isn't my personal favourite as I love sweeter scents. But I think we can all agree that it is BEAUTIFUL 🙌🏽. Next up we have monsters' ball (£4.25), which is clearly a halloween exclusive! It has quite a fresh smell due to the ingrediant of lime oil, howevr I love that it also includes fair trade organic cocoa butter. This makes the bath so much more relaxing and the smell is fresh, with a slight gloral mix and it turns the bath a bunch of different colours from pink - blue. I love how it was still fizzing for a while after it was placed in the bowl and I think its the perfect autumnal treat! On the left hand side we have butterbear (£1.95) which is by far one of the most affordable lush bath products! 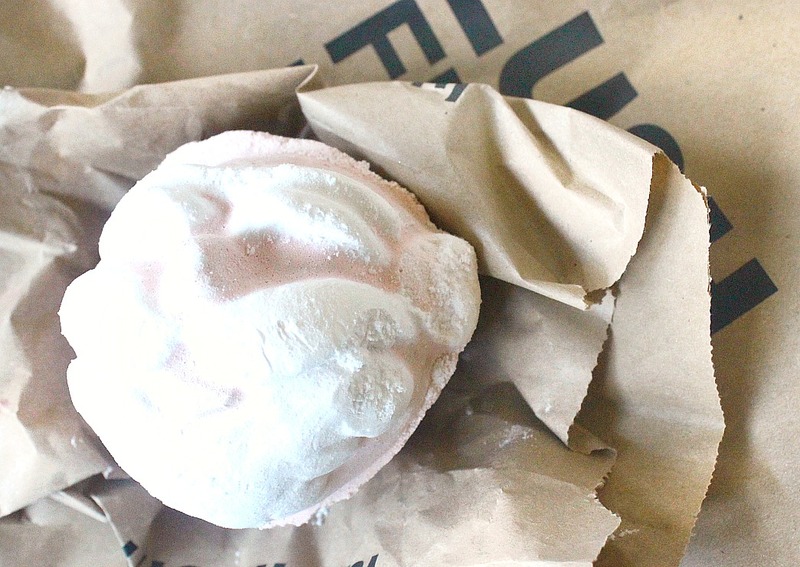 Although it doesn't look as exciting as the others, this bath bomb is one of the most comforting and contains very few ingredients. Amongst those we have fair trade colombian cocoa butter, ylang ylang oil and cocoa powder. I think this is one of the most moisturising bath products in the whole store - do pick it up if your skin needs some comfort! Moving on to the brighter yellow and pink concoction, this bath bomb is called Never mind the ballistics (£4.25), which has a very sweet smell - not snow fairy sweet, but literally candy sweet! It contains the wonderful cocoa butter, as well as lime oil, sweet wild orange oil and fresh banana! Again its lovely for the skin and a real beauty to look at. And finally one of the beautiful bubble bars: The magic of christmas (£5.95), look how pretty it is! I have to say I do love a good reusable product and I think you'll love this if you're into warm cinnamon scents. This product contains cinnamon leaf oil, Almond oil and sweet orange oil and has the cutest little bell attached to it too! 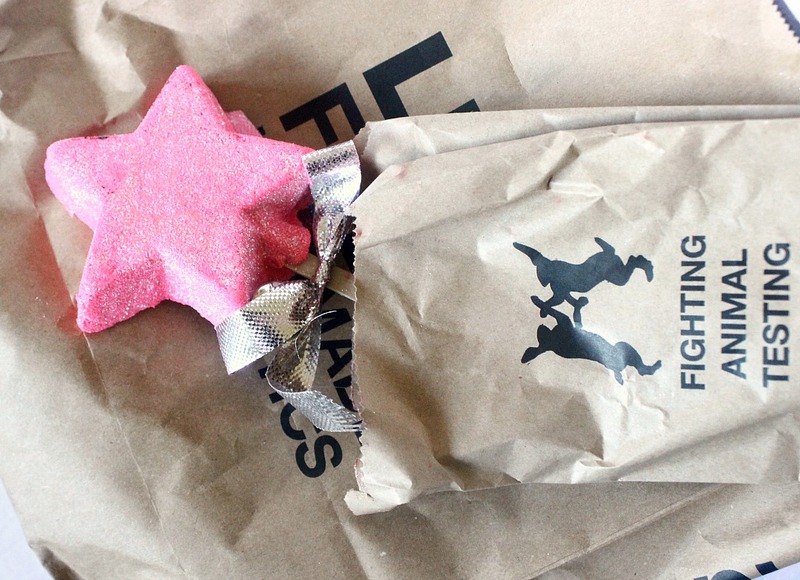 Firstly we have another reusable bubble bar wand, which does by the name of magic wand (£5.96). This version makes the bath water turn a hue of pink and of course has the classic bubblegum snowfairy smell, which I adore! I am a huge fan of sweet smells, so I had to treat myself to this. I also picked up two bath bombs...with the first being Father christmas (£3.75), another repeat from last year. It again has the snow fairy smell and it also has a green centre - which means the water turns this colour! Lets be honest, I don't plan on using a whole one for just one bath so who knows how much of the colour I'll see - but I love the fact that this smell lingers and I think it'll make a good couple of soaks! The final bath bomb I purchased is one I showed above: Never mind the ballistics (£4.25) which I'm super excited to use 🤗. I also asked the lovely lush ladies to recommend me something for my very sensitive skin, after or before shaving. If you've been following my lumea journey, you'll know how much I despise shaving because my skin comes out in rashes and bumps. 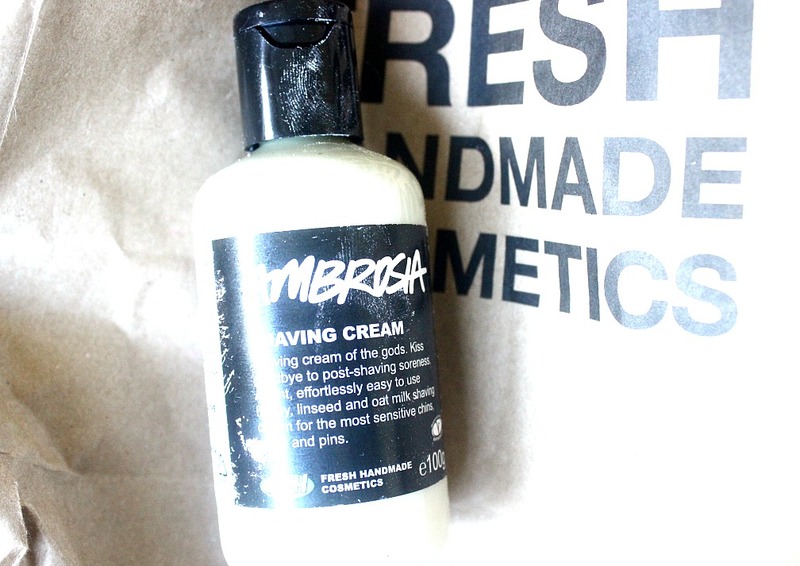 They recommended the Ambrosia shaving cream (£4.95 - 100g), which contains oat milk, cocoa butter and several oils. They all go a long way in ensuring my skin is comfortable and so far it has been working a treat! My skin is less irritated and feels super smooth to touch, making shaving less of a pain. I also purchased the well known cleanser from Lush, which I totally forgot to take a photo of. The Ultrabland cleanser (£12.95 for 100g). Now it was a little pricy as you can see and perhaps I should have purchased the smaller one, but in terms of value for money this made more sense! This is a cream cleanser, so a little goes a long way and it is packed full of brilliant natural products, a few of them are: honey, almond oil and rose water. I love how nourished and clean my skin feels after wiping this off with a damp flannel, however I will be using another cleanser alongside this so I can keep using my vanity planet cleansing brush - as I've really noticed a difference in the lack of exfoliation with my skin! So, so far I'm enjoying it, but it's not my only evening cleanser in use. The final thing I wanted to share with you all is the two samples we were kindly given. 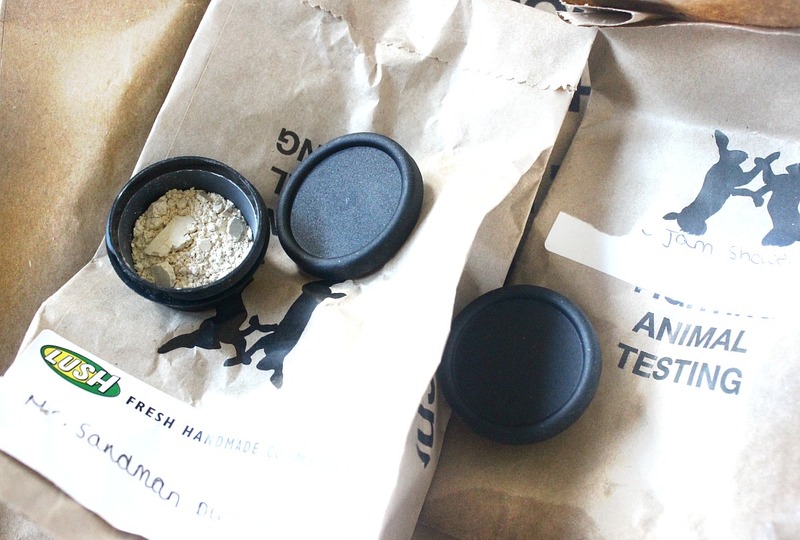 I was thrilled to get the Mr. Sandman dusting powder, which is a stunning golden/silver powder that you literally dust over your skin. I think its perfect for a special occasion and it also has a beautiful lavender scent. They also gave me a small sample of a shower gel which'll be interesting to use! What has caught your eye from Lush's recent collections?